A good e-commerce website is simply one that provides the customer with an excellent user experience. Whilst the purpose of e-commerce sites are essentially to sell products, it’s not just the number of sales that indicates success. E-commerce sites are more than providing your customers with product information and pictures, with a ‘check-out’ function – it’s about delivering a user experience that will keep customers satisfied and coming back to the website. There are factors that influence the success of an e-commerce site, and so here are some crucial must-haves that an e-commerce site needs to be successful. The best e-commerce websites make use of professional website design and layout that appeals to customers – great navigation goes a long way in e-commerce. The design should be minimalist, with a clean layout and be optimised for mobile. Most online transactions are carried out on a mobile and sales will be lost if the website has not been developed for the mobile experience. A mobile friendly web design is a must for the 21st century. It’s about putting yourselves into the customers’ shoes and thinking about what they want. Easy-to-read typefaces, bold and clear headlines and appealing colours will massively help the user experience. 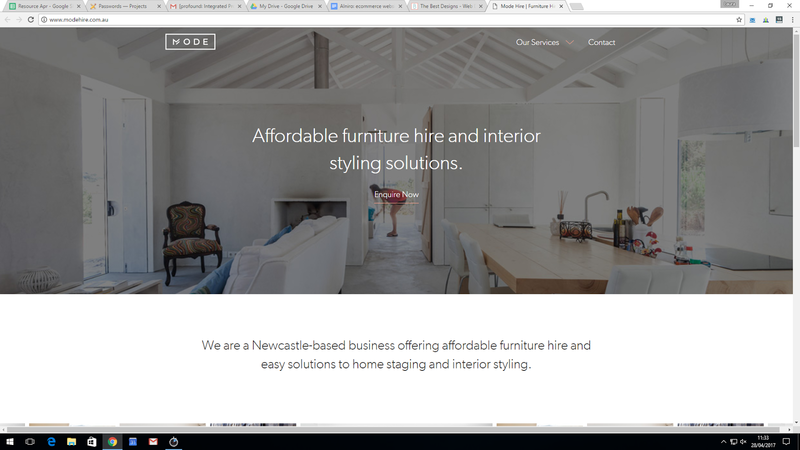 A great example of a website with excellent design and layout is that of ‘Mode Hire’, an Australian business working in interior design and furniture hire. The homepage uses the layout effectively with whitespacing. Not only does whitespace help pages to look clean and fresh, its benefits include increased legibility and comprehension of the text, whilst drawing the user’s attention straight to the page. Good product and landing pages are an absolute must-have when it comes to e-commerce. The product information needs to be clear, concise and to the point, with straight-forward delivery information. High-resolution photographs of the products are crucial as images ‘sell’, and not text. Every page on the site also needs to have a fast speed when loading, otherwise, customers will be lost to a competitor site with a faster speed. You can take help of an e-commerce website designing company to optimize your pages. Johnny Cupcakes is a company that utilises excellent product pages. They are a clothing brand that uses cupcakes as a design motif for their merchandise and their product pages use whitespace and have large and clear images, with ‘straight to the point’ text. 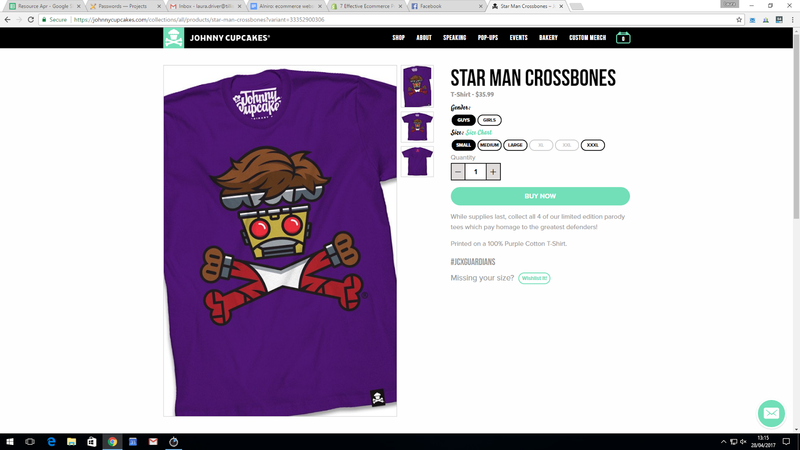 What’s particularly brilliant about their product pages is that for each product, they’ve attached a hashtag unique to it and for the product in the image below, its unique hashtag is: ‘#JCXGUARDIANS’. This means that they can cleverly promote each product across social media platforms. Good customer service is key in not only making sales, but in retaining customers too. Customers appreciate and remember smooth and easy check-out processes and easy returns of products, making them more likely to purchase from the site again. Customers love free shipping too and offering free delivery of products can increase overall revenue by as much as 10%. 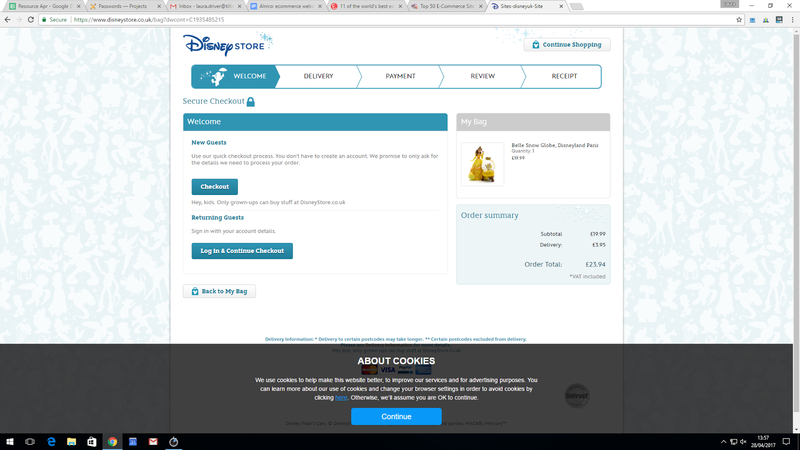 Disney is one of the globe’s most popular brands and their checkout process is smooth, quick and easy. They utilise five steps maximum for their online checkout process (‘Welcome’, ‘Delivery’, ‘Payment’, ‘Review’ and ‘Receipt’). When it comes to checking out, the process is quick because they have allowed for a ‘guest’ checkout, skipping the ‘you must register and create an account with us before purchasing’ process. Research has shown that forced registration causes purchases to drop, as 50% of users typically leave the website before completing their purchase if they have to register first. In summary it essential to provide your customers with an excellent user experience on an outstanding e-commerce website with brilliant layout, clear product and landing pages, and a smooth check-out process to get ahead of the e-commerce game. What are toughest challenges that face with your e-commerce website? Laura Driver is the Content Specialist for Digital Marketing Agency Tillison Consulting. Writing for a broad spectrum of online clients sees Laura experienced in lifestyle, home, and business topics. When Laura is not crafting content, her bike is her best friend and she loves to cook amazing Italian food.